Step 1 Place the orange juice in a small heavy saucepan over medium heat and simmer until reduced to about 2 tablespoons, about 20 minutes. Step 2 While the juice reduces, brown the sausages in a nonstick skillet over medium heat, 3 to 5 minutes. 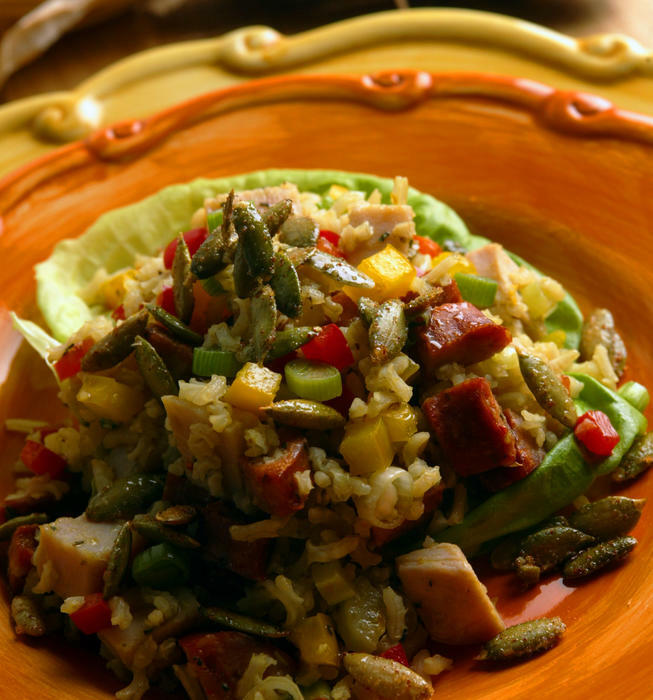 Drain and combine in a very large bowl with the rice, turkey, celery, green onions and peppers. Toss until well mixed. In Recipes-list.com we have selected the most viewed recipes from category - Leftovers Salads . Enjoy the best recipes specially selected for you! Andouille-turkey salad with spiced pumpkin seeds is the right choice that will satisfy all your claims.